Before 1995, there were only less than 3 Maldivians with a personal home page. Ten years later it has grown to a level that is hard to keep track of. More recently with the emergence of blogging, a lot more Maldivians have started to release their thoughts into the blogosphere. mvblogosphere is an attempt to track, map and analyze the exponentially growing Maldivian blogopsphere, in order to draw a larger portrait of the social, cultural, political and economic structures they represent. As the authors explain: "An interesting observation is the way each blog is linked to another. As we humans are social animals, we tend to form different levels of links with others in the society". 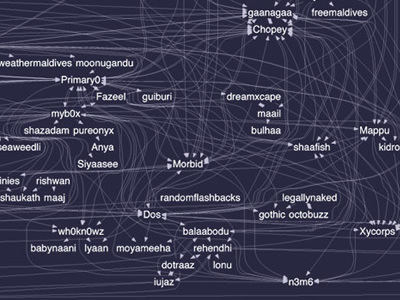 For this purpose the authors have produced an array of interesting visualizations showing different aspects of the Maldivian bloggers network. 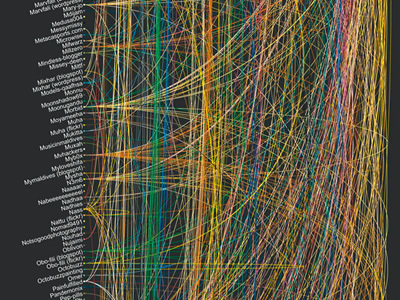 The second image is a portrait of the interlinked network as of January 29th, 2006. The first image represents a detailed view of the same network as of October 24th, 2006.
very intriguing pictures. will we use such tools in practicing way?